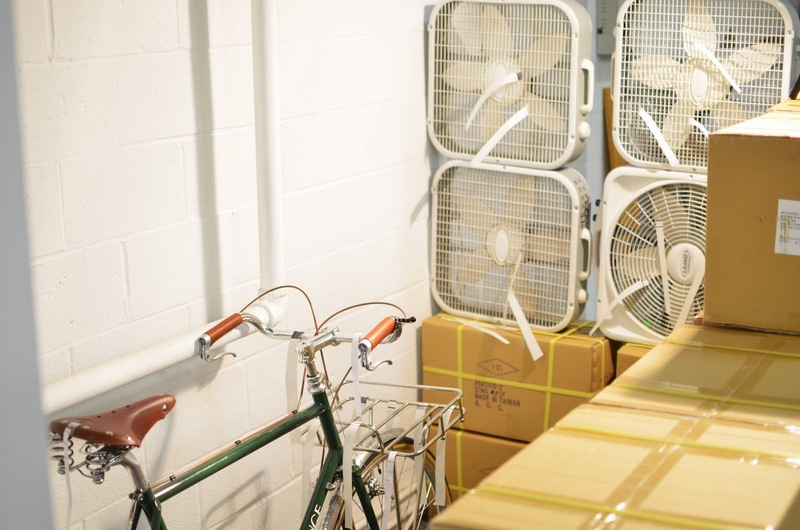 When we read about Specialized building a wind tunnel to develop their racing bikes, we decided VO should have one too. Of course our budget is slightly smaller. But Igor got our wind tunnel up and blowing at almost no cost. Expect an aero porteur rack for 2014. What else can we streamline? I wanted to update everyone on our frame building schedule since we've been getting a lot of questions about when various frames and sizes will return. The Campeur has been selling very well and we're out, or running out, of several frame sizes. Another production run should be here in 3-4 weeks and all sizes will be back in stock then. This has been our most successful frame and it's hard to keep it in stock. The Pass Hunter is next in line and should be available in early fall. The Polyvalent stock is even lower than the Campeur; sorry about that. The next production run is scheduled for late summer or fall so we may be six months out on those. Another new frame, that I'll post about soon, is due to arrive a couple of months after the Polyvalents. As for other items, we just received a container of components and accessories, so stock levels are pretty good on most. Another container arrives in late June. We'll receive any remaining out-of-stock items then, including Campeur racks. Some of you may be familiar with Marshall McLuhan. He was a philosopher of media in the late 1960s and on into the 70s. He is probably best know for the expression, "The medium is the message." What this means, at its most basic, is that the medium (i.e., radio, television news, youtube) intrinsically affects the message it carries. Paraphrasing this to the realm of design, it can also be said that the manufacturing process (i.e., cnc milling, forging, welding) is the design. The design of the new Grand Cru pedals that we announced last week provide the perfect platform for me to explain what I mean by this. First, some basic background on what the new grand cru pedals are designed for: They are designed to be used with toe clips and straps. For this reason we chose to make them one sided. One of the perks of a one sided pedal is that you can use much larger bearings and still have a relatively thin pedal. Larger bearings are primarily useful for their increased longevity. 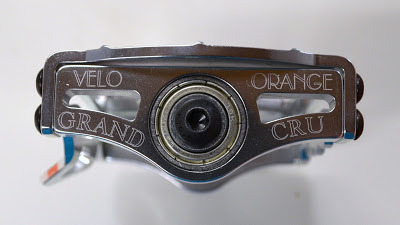 These pedals were also designed around a similar premise to that of the Grand Cru Sabot pedals: we wanted a wider and more comfortable platform for people with thin-soled shoes and/or big feet. The design for the new Grand Cru pedal was initially inspired by Barelli pedals. I've thought for some time that Barelli pedals are very good looking single-sided pedals. 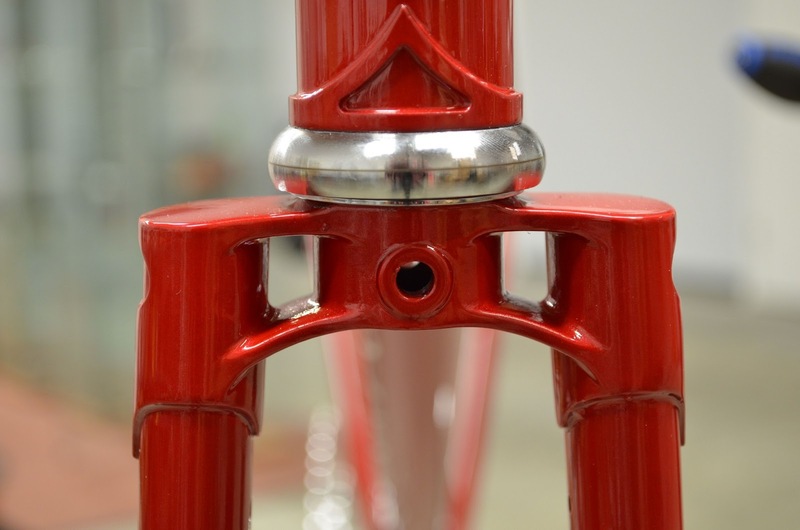 The design of the Barelli pedals also accommodates larger bearing sizes. My initial hope was to create the sides of the pedal with CNC milling, and then use stamping and bending to fabricate the top plate of the pedal. This would have remained in the spirit of the original Barelli pedals. Unfortunately, we had a very hard time finding a manufacturer who would do the bending and stamping that we wanted. In every design there are sacrifices that must be made to maintain the initial design goals (cost, aesthetic, functionality). 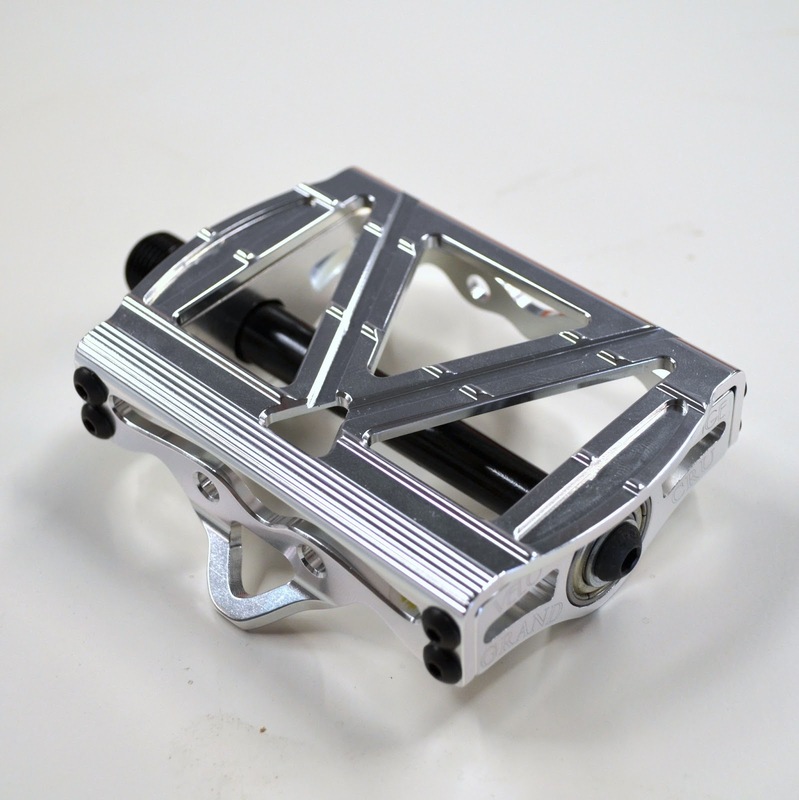 To accommodate all of these design goals we eventually decided to fabricate the sides and top plate of the pedal by extrusion and CNC milling. For those who don't know, CNC machining refers computer controlled machining (in this case milling). 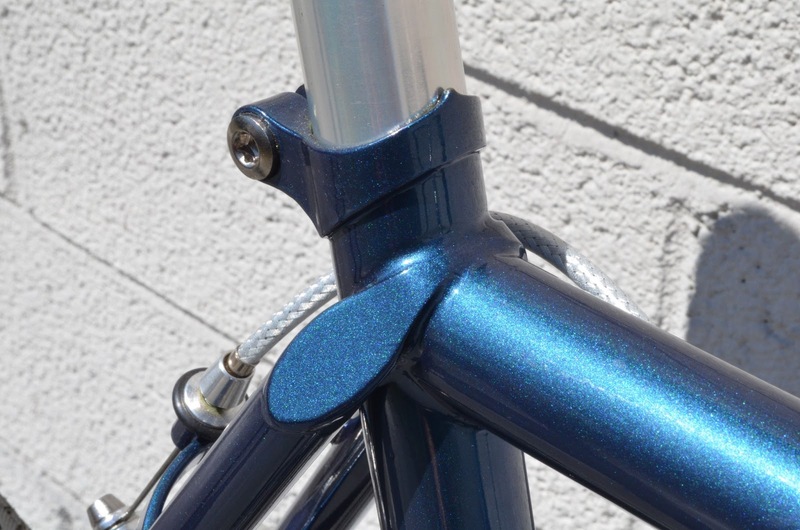 CNC milling is currently one of the more popular manufacturing methods for bike components. It's easy, low initial cost, and allows for small runs. There are some problems with CNC milling, though. From an aesthetic perspective, CNC milled components generally have a very distinctive look to them. Getting back to my original point, the manufacturing process is the design. Very intricate and beautiful parts can be created using only CNC milling, but this is generally at a very high cost and with a lot of waste. I know that there has been a lot of hype over CNC milled components and their precision for a while now (particularly from American component manufacturers). I can understand that there is something impressive about creating a component out of a solid square of aluminum. However, I think that with the influx of CNC mills into the cycling market that novelty will start to fade away and people will begin to realize that this is just an over-glorification of functionality. It often times leaves you with square and industrial looking components. Again, the medium is the message: these square and bulky looking parts generate associations of manufacturing 'precision'. Nowadays a more than adequate level of precision is very attainable through most component manufacturing processes. 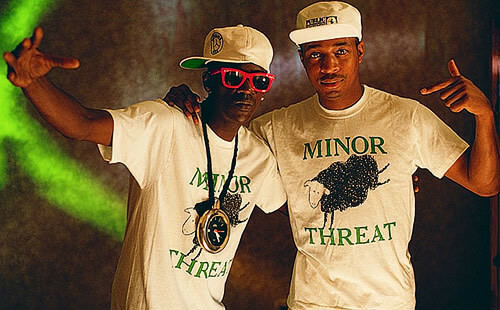 These associations, more than anything, are just residuals from a time past. There are also other problems with exclusively using CNC milling to create a part. Creating a component out of a solid block of aluminum generally creates a lot of waste, and to create an intricate part takes a lot of time (running costs). This can substantially increase the overall cost of the product. All of this is not to say that CNC machining should not be used to create bicycle components. CNC milling can be exceptional useful in fabrication and it does have many advantages for certain designs. Sheldon Brown's comparison between forging, casting, and CNC machining is worth a read if you want a deeper look into this. To echo similar curmudgeonly sentiments from my Steel is Steel blog post; don't believe the hype. Exclusively CNC milled components are often times not better than forged for being more precise; they are also not stronger. There are certain components where exclusive CNC machining is apt, but it doesn't need to be used for all components. Instead of being enamored by the process (medium), look at the the more general aesthetic and functional value of the component. Doing this can often leave you with better looking and more affordable components. For all of these reasons we decided to make the larger initial investment to create our own aluminum extrusions. This allowed us to fabricate a part with clean visual lines and curves and to keep cost low by minimizing waste and milling time. We are very excited about this new pedal. So far I've loved riding around with the prototypes. I think that an affordable, attractive, and high quality single sided platform pedal is something that the market has been missing for a while now. If you're unfamiliar with Cirque du Cyclisme, it's a weekend show in Leesburg, VA filled with bikes (and people) of all sorts vintages and styles. It's a fun show that's also accompanied by rides, talks, and swap meets. This year Adrian and I went out on Sunday and had a serious ogling session. A full album of the photos can be found here. First bike bunch featured a very cool Peugeot touring bike outfitted with a Simplex chainguard, minimalist Huret derailleur, wingnuts, fenders, and very classy front rack. In the same group, we came across a Spanish made Sacile. Very cool filed lugwork, internal routing, and a full chainguard. Wild folder with very cool cable routing. 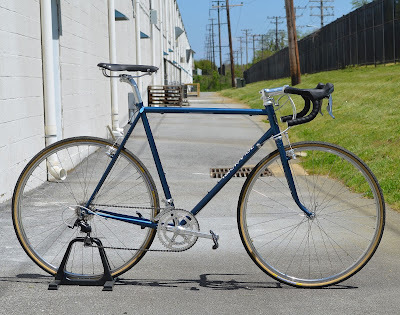 Masi 3V made for the the Soviet team. 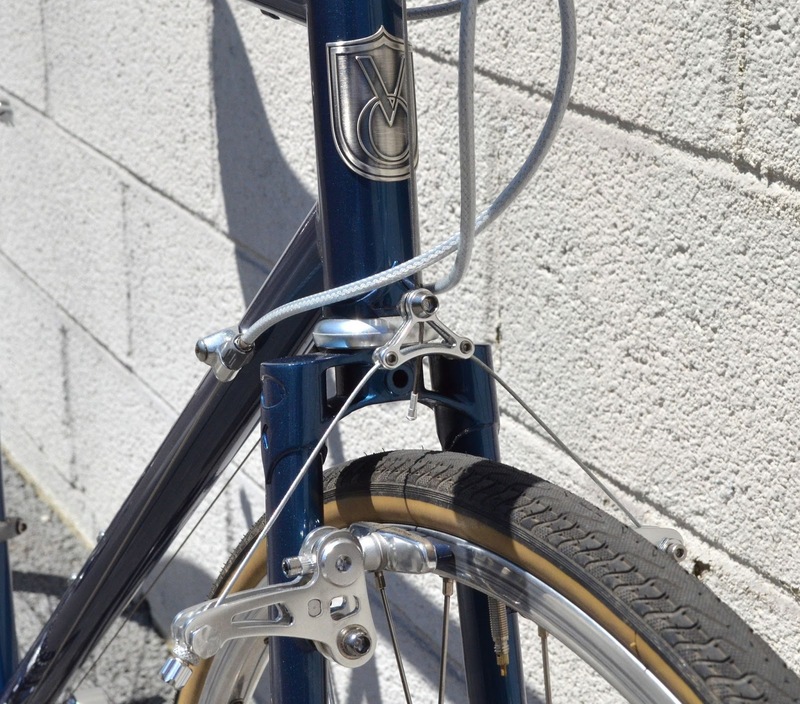 I think the Italians may have made the downtube/seatube Masi decal (N is backwards). Earle from Earle Wheels had lots of beautifully built up wheels with some cool lacing patterns. Earle's unique lacing pattern (30h rim and 30h Normandy hub). Crowsfoot and radial lacing. No real reason why besides because he could. Of course, lots of New-in-Box products. JP Weigle always has a beautiful one of a kind bikes with lots of custom bits. VO bits were seen all over. This tandem has our Zeppelin fenders. Our Tall Stack Stem with a clock nicely mounted. Nice stitching on this Guerciotti. Seemed like a big thing this year was Drillium. 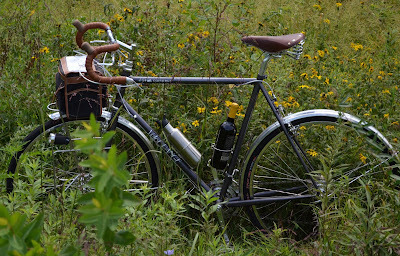 Lightened cranks, derailleurs, and levers were in full force. Grand Cru Quill Stem with Course Handlebars on a nice '53 Hetchins. Lastly, the longest stem I've ever seen. Every so often we review where our marketing dollars should go, or not. We avoid the topic for weeks, then we're suddenly facing a deadline. I rail equally against print media and web ads, which I never ever click on unless my finger slips. I moan that in the good old days (2006) all we needed was the VO Blog as our main advertising vehicle, since there weren't as many bike blogs then as there are now. 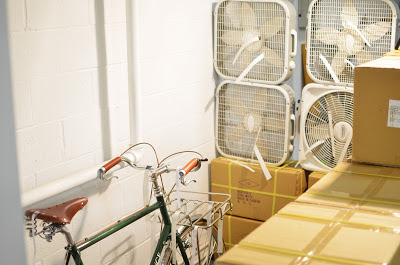 And also in the good old days, under our old ecommerce platform, every order was linked to a point of entry (e.g., if you came to Velo Orange from, say, a lingerie site, we knew it.) Then we again table discussion and move on to how our new coffee maker is performing. And so we repair to our focus group, you, because I don't think we've ever asked you before: Where did you first encounter Velo Orange? Did you look for a specific item on the web? Pass a VO frame on the trail? Peruse a style blog? We'd greatly appreciate your taking the poll below; if you choose "other," please tell us in the comments what that "other" is. 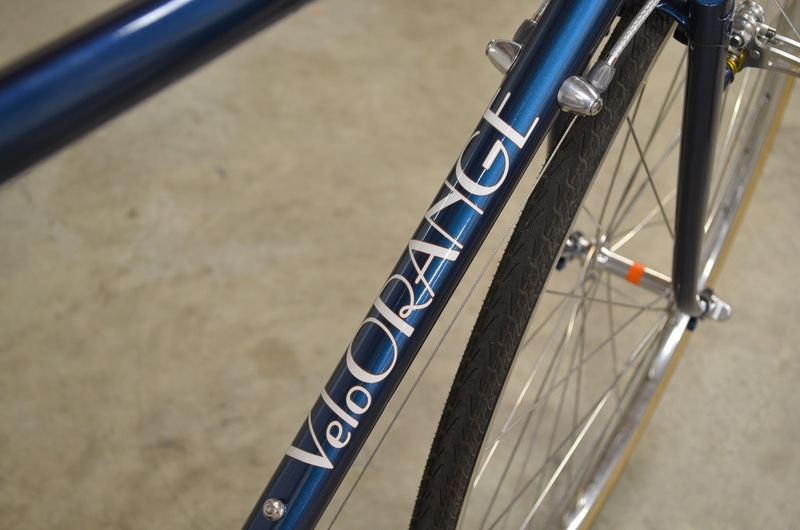 How did you find out about Velo Orange? We've wanted to make VO designed bag loops for a couple of years now. They are so handy if you ride a saddle without built-in loops. 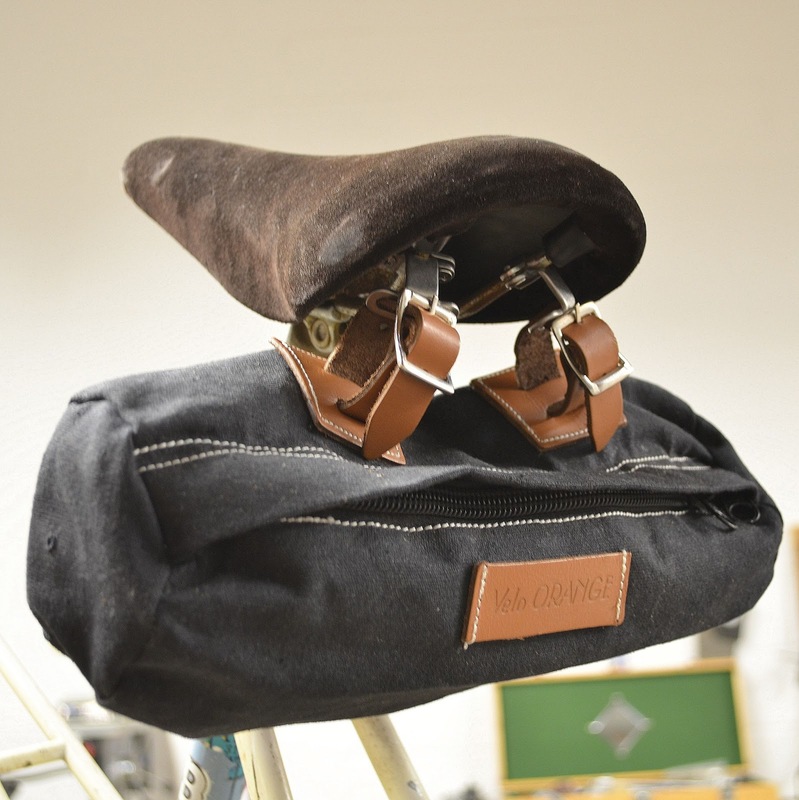 Saddle bags are the simplest way to carry a few things on a bike without racks. But we were having trouble coming up with a design that we liked, yet was economical to manufacture. By chance we stumbled upon these stainless steel bag loops already being made in Taiwan and decided to import them. We hope to have the first shipment in a month or two. We're testing our newest Grand Cru pedals. 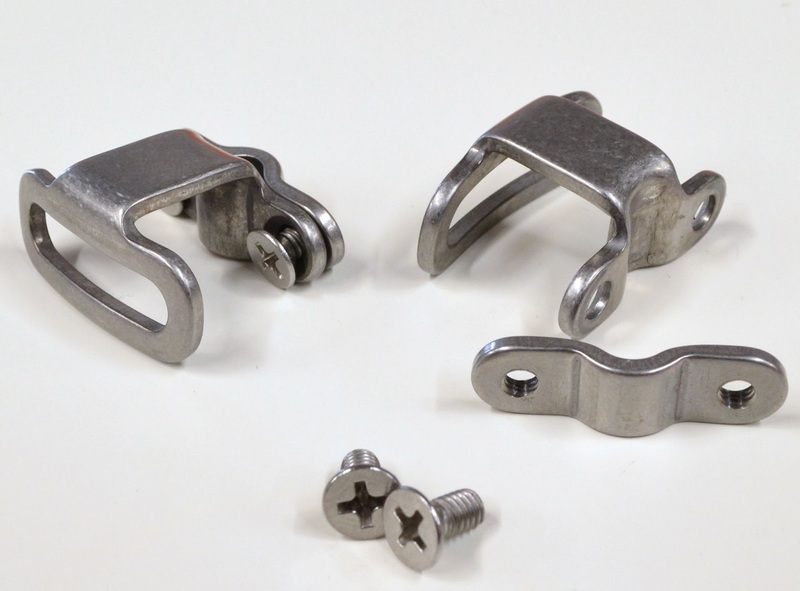 They are single sided pedals intended for folks who use toe clips or half clips. The design is inspired by the old Barelli pedals. The spindle is tapered and spins in giant double sealed bearings*. The platform is 100mm x 72mm, so there is plenty of support for big feet and soft street shoes; they are very comfortable. These pedals are also a little lighter than the Sabot pedals. The production version will have a silver spindle and hardware. Except for the bearings and hardware, every part of this pedal is designed by VO. 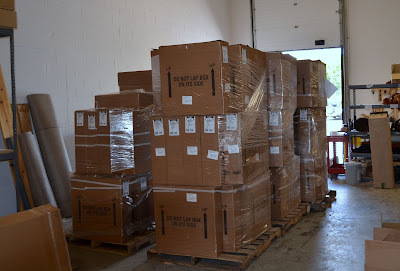 In other news: we just got a few pallets of wheels from our builder, including some that had been out of stock. 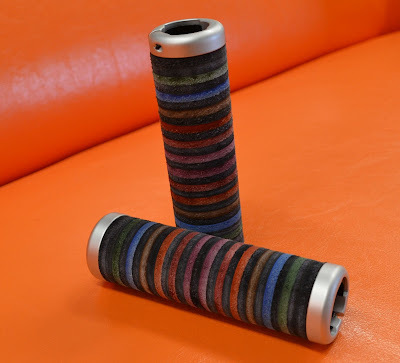 These are my new city bike grips, I'm not sure if we'll sell them, but I love the colors and wanted some for my own bike. You like? * This prototype has shielded ISK bearings installed (this note is only for you engineers out there). We sure got a lot of comments on that last post, so I thought I'd expound on why we designed the Pass Hunter frame as we did. 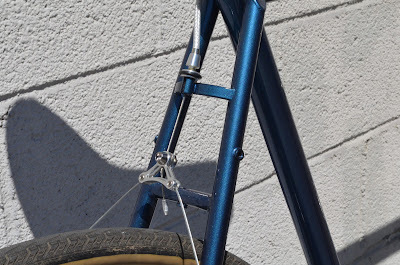 The bike is TIG welded, but with some "luggy" bits, such as the head tube reinforcement collars and seat cluster. 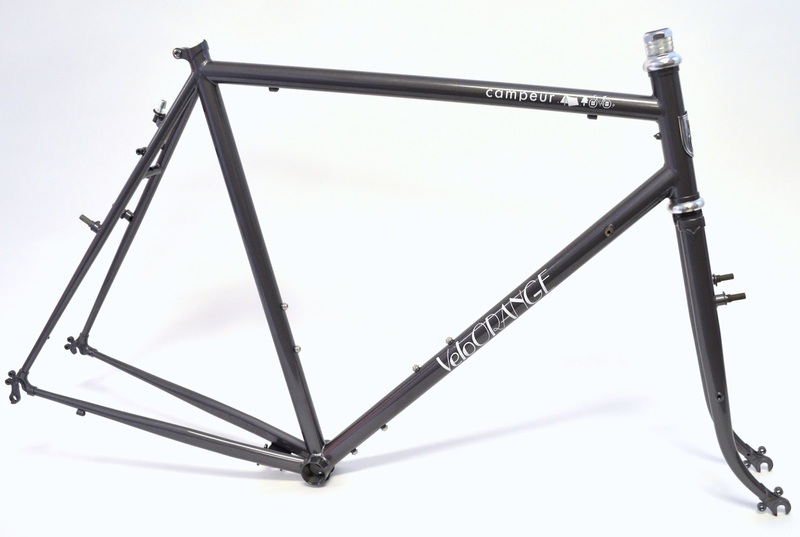 I can't see the advantage of lugged construction for a frame like this. Not having lugs lowers the cost by $200 to $300. Lugs are pretty, but really high quality TIG welding should be appreciated as well, and our builders do some of the best anywhere. Finally eliminating the lugs saves some weight. The trail was described as "mid-trail". That is to say it's between traditional French geometry and modern race-inspired sport-touring geometry. It's based on extensive research and trial and error here at VO world headquarters. We had to learn to re-rake our own forks so we could adjust the trail until it was perfect. We think this geometry, which has been much praised on the Campeur, allows front or rear loading, stable high speed descending, and just the right balance of quick handling and stability. We decided to go with the 1-1/8" fork for several reasons. 1-1/8" is more-or-less expected on high performance bikes today and we wanted to make this bike appealing to non- retro grouches. 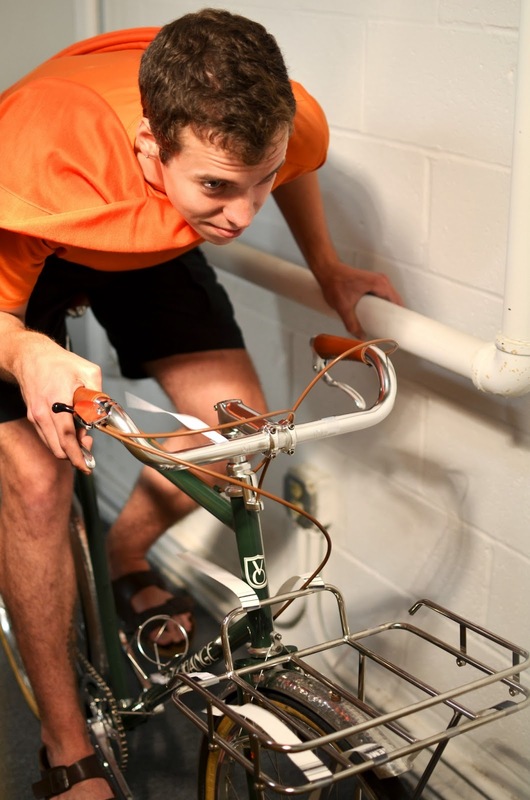 Most Pass Hunters will likely be bought by experienced cyclists who probably know exactly where to set their bars, so quick stem adjustability was not as high a priority. Likewise, the vast majority of these will be built with drop bars, or perhaps MTB bars if pass hunting on gravel roads. I also, personally, wanted to try something different, not just make what's basically the same bike over and over again. The threadless fork is a little lighter and stiffer. And a stiffer head tube and steerer tube can't be a bad thing when bombing down from those high passes. 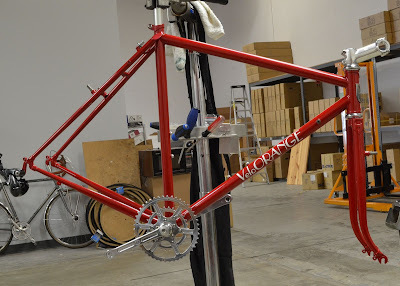 We plan to make one more frame with a threadless fork, but we also plan to keep the Campeur and Polyvalent 1" threaded, as well as the mixte (when it returns in a year or two). The cost has not been determined, but we're trying to get it under $600. We're still shooting for fall availability. Finally, we've decided, after reading your comments and discussing staff preferences, to make the frame red. The decals were a harder decision, but we decided to go with two. There will also be a small decal on the seat tube. Here are a few photos of Pass Hunter Prototypes. 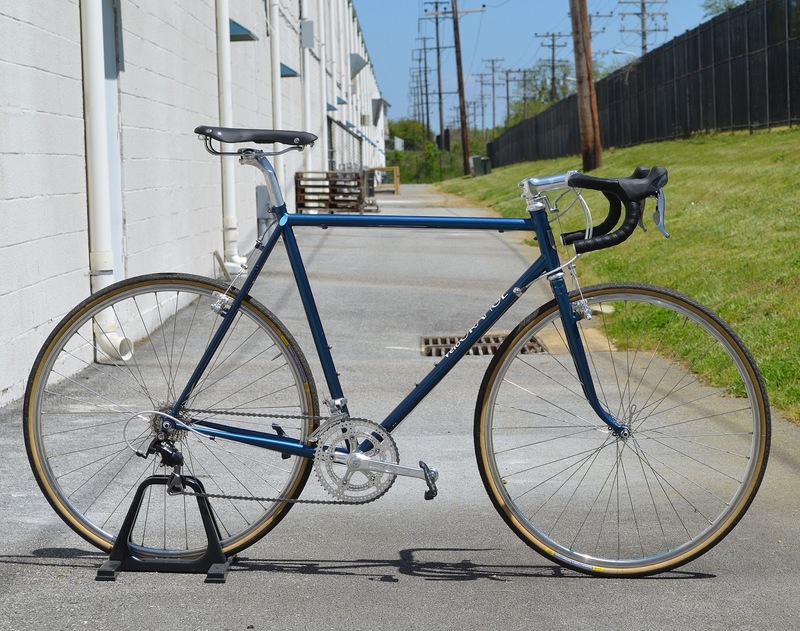 Basically this new frame is a randonneuse, but with canti brakes. The cantis allow wider tires with fenders and more powerful braking. 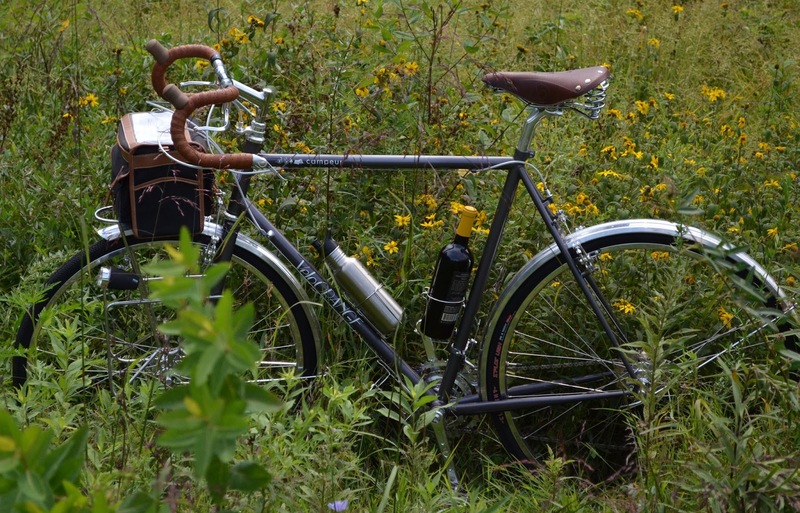 The Pass Hunter is built using slightly lighter tubing than the Polyvalent or Campeur. It has mid-trail geometry, much like the Campeur. The term "pass hunter" refers to the sport of riding over mountain passes, more popular in France and Japan than here. Rules are explained on this page. In addition to randoneuring and pass hunting, the Pass Hunter would make a nice sportiff or even a fast credit card tourer. We hope to have them in stock in early fall. 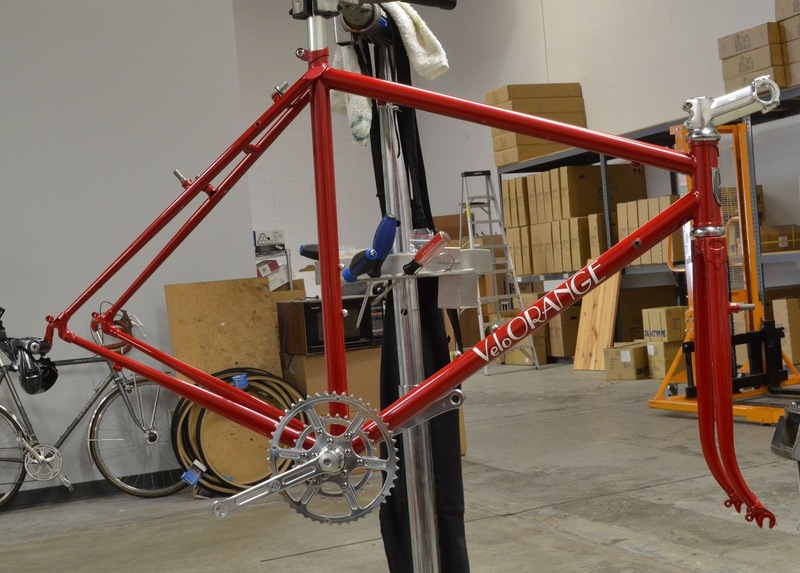 Scott is building this one up as his rando bike. 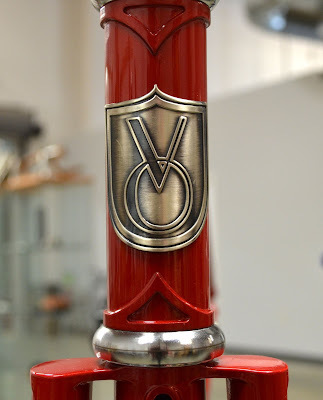 One down tube decal, or two? Red or blue paint? Cyclists are a funny bunch when it comes to food. I've never seen such a crowd that has such diverse interests/needs when it comes to food. Some cyclists are all about food as fuel, while others ride to be able to eat. When touring in Australia 20 + years ago, my eating habits were formed by two things- the cost of the food and ease of preparation. Considering I was 19 years old and not a great cook at home, this is not surprising. So a tin of pineapple for breakfast, a Chiko roll (a deep fried beef and veggie roll http://en.wikipedia.org/wiki/Chiko_roll ) and some fries at lunch and chunky soup out of a tin for supper. The pineapple and soup could be bought at any small town store in Tasmania and the Chiko roll could be bought at any gas station or such along the way. A combination of this diet and 60-70 miles on hilly roads on a loaded touring bike led to a 30 lb weight loss on that trip over 3 months. Before working here at VO, I worked for GU energy gels in SF bay area. I worked in the production end of the company, organizing the delivery of the mountains of ingredients that made up the gels that we produced in Berkeley. I was surrounded by employees of GU who regularly ran marathons and took part in long distance cycling events. As a long distance cyclist myself, the easy access to energy gels was a great part of the job, as was the culture of endurance athletics. My fuel choice as an endurance cyclist was still driven like it had been when I was 19 and touring- ease of delivery and cost. The gels were easy to eat on the road, came in a variety of flavors to suit my palate, were easy to transport on long rides and fairly cheap given the number of calories. Now as I ride, I find myself using gels and such less and less and trying to eat more “normal” food on our rides that pass through rural areas of Pennsylvania, Virginia and Maryland. When I rode the Endless Mountain 1000 brevet a few years back, I carried gels with me, but I also used rice crispy squares as a supplement while riding and tried to have a good sit down meal during the day to keep my energy levels up. During the course of a three day event like the 1000, my taste buds would rebel against the sweet taste of the gels, so stopping to eat a pizza or other savory items made getting the calories needed easier to get. On our fleche ride this past month, one of my team mates had made his own rice bars to eat on the ride and we stopped for a great lunch at the Little Grill Collective in Harrisonburg VA. The meal and the questions about bike touring from the workers at the grill were a highlight of the ride. Lots of riders have a favorite coffee shop to end a ride at. Judging by the number of comments we got when Annette asked about coffee makers, I think coffee may be the most popular "fuel" for cyclists. With a rising interest in some rural gravel rides this year and some touring lined up for the late summer and fall, I think more small town deli's and cafe's may be in my future as I go from eating to ride to riding to eat. What do you eat on long rides? Any suggestions for good foods to carry?